This original version of the Ultra Directional RNA Library Prep Kit enables strand-specific RNA library preparation in a streamlined workflow. 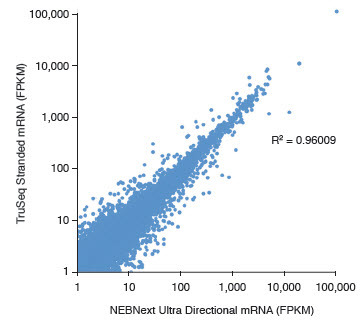 However, we now recommend the new NEBNext Ultra II Directional RNA Library Prep Kit for Illumina (NEB #E7760), which has been further optimized to provide increased yields of high quality libraries from a broader range of input amounts. The NEBNext® Ultra™ Directional RNA Library Prep Kit for Illumina® contains reagents for preparation of strand-specific RNA libraries for Illumina sequencing. Please note that adaptors, primers, rRNA depletion reagents and poly(A) mRNA isolation reagents are not included in the kit and are available separately. 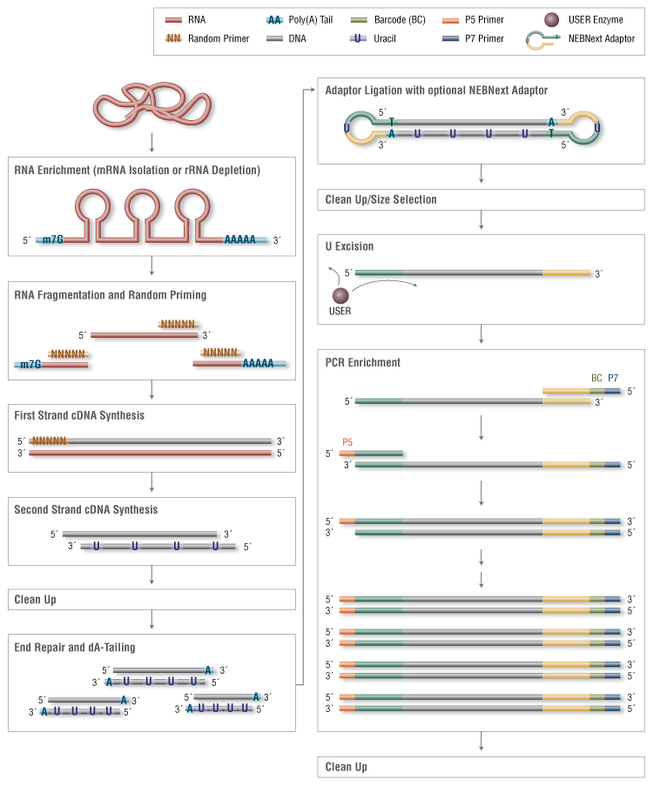 Ultra Directional RNA libraries of mRNA purified from Universal Human Reference RNA (Agilent® #740000), were sequenced on the Illumina platform. The high percentage of reads mapped to the expected strand shows the high strand-specificity of the libraries. 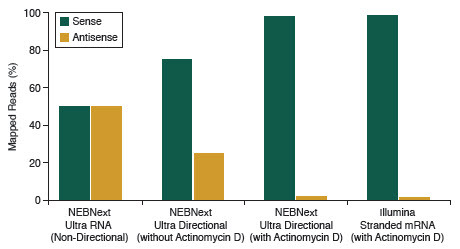 Actinomycin D is required to achieve maximal strand specificity. mRNA was isolated from Universal Human Reference RNA (Agilent # 740000) and libraries were made using the NEBNext Ultra™ Directional RNA Kit and the Illumina TruSeq Stranded mRNA Kit. Libraries were sequenced (single end reads) on the Illumina platform (GAIIx). Good coverage across expressed transcripts was obtained. 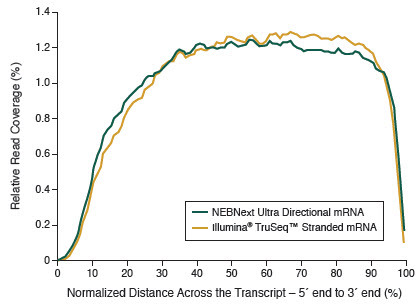 Ribosomal RNA-depleted RNA libraries were made from 10 ng or 100 ng Universal Human Reference RNA (Agilent #740000) using the NEBNext Ultra Directional RNA Kit. 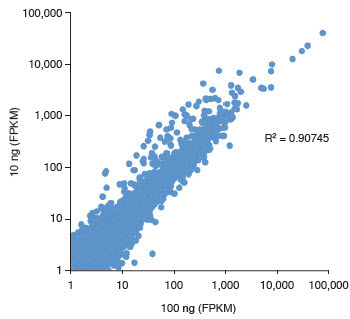 Transcript abundances in Fragments Per Kilobase of exon per Million fragments mapped (FPKM) show strong concordance (R2 = 0.90745), indicating retention of library complexity even at low input amount. Technical replicates of mRNA libraries made from mRNA isolated from Universal Human Reference RNA (Agilent #740000) show strong concordance (R2 = 0.99409). mRNA was isolated from Universal Human Reference RNA (Agilent #740000) and libraries were made using the NEBNext Ultra Directional RNA Kit and the Illumina TruSeq Stranded mRNA Kit. 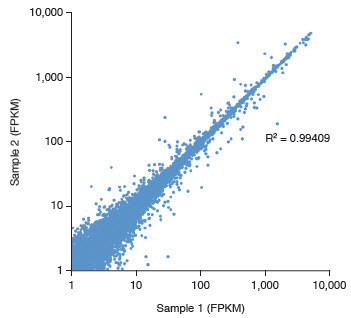 This FPKM concordance plot shows comparable transcript representation (R2 = 0.96009) between the libraries. What protocol do I use if starting with previously isolated mRNA or ribosomal depleted RNA? I have USER® Enzyme from my NEBNext® library prep kit (blue cap) and USER Enzyme from my NEBNext Index Primer kit (red cap). Are they the same?